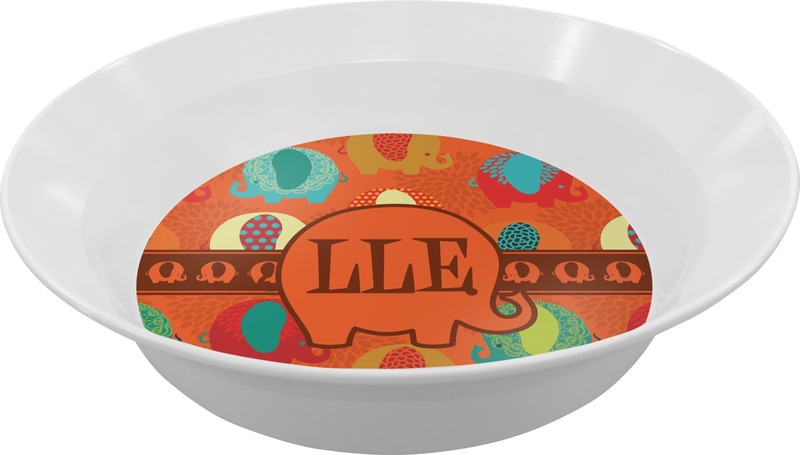 Our personalized bowls are fun and functional! They are a big hit with kids and moms alike. Everyone loves the fun designs, patterns and color, along with the name and monogram personalizations. Our melamine bowls are BPA free, dishwasher safe, and best of all drop and break resistant. With very little care, these bowls can last a lifetime! They hold about 8oz of liquid comfortably (but if you like filling your bowl to the top it can fit closer to 12oz). The bowl has a lovely top that tapers outward to give it a little more flair. Grab the perfect background, ribbon, monogram, and more to create an amazing design. We have a plethora of design elements to choose from within our system. Have fun exploring and let us know if you have any questions. Be sure to compare these to our Melamine Bowls 8oz as well. The main difference is that the Melamine Bowls 8oz have a more functional look. Check out our Kitchen section as well where you will find melamine and plastic plates, plastic bowls, drinking glasses, and more. great product, fast arrival for personalized items, fun and easy to use design page---i could have spent all day designing!!! Very cute but was small!! Thought it would be a bigger bowl!